These are a favorite of my nephew, Cole’s. See his baking adventure here. Put butter, peanut butter, 1 cup sugar, brown sugar and eggs into mixing bowl. Beat with electric mixer on medium until smooth and creamy. Mix in flour, baking soda and baking powder. Cover and chill for at least one hour or overnight. Shape the dough into balls. Shake three balls at a time in a plastic bag with 6T sugar. Place the balls two inches apart on a cookie sheet. Bake at 350 for 8 minutes. 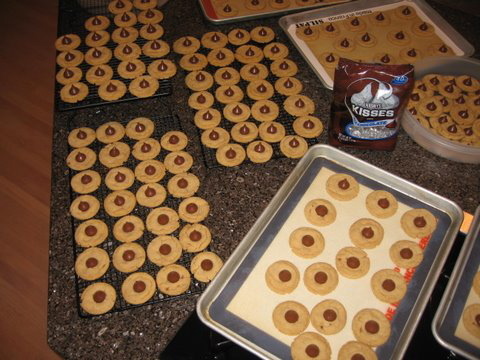 Put a chocolate kiss in the center of each cookie and press down gently. Continue baking 2-4 minutes or until chocolate has melted down a little. 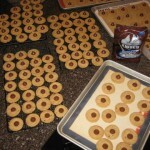 Remove cookies with pancake turner and cool on cooling rack. 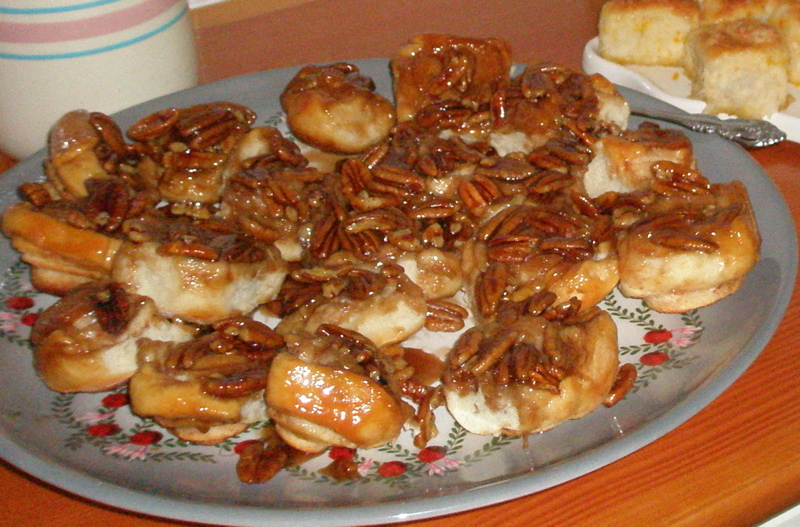 I start these in my bread machine, then turn them out to form them after the dough rises. You could do it all by hand if you prefer. Add the following ingredients to the bread machine: 1-1/4 cups milk, 3 cups flour, 3 tablespoons sugar, 1 teaspoon salt, 3 tablespoons butter, 1 tablespoon dry yeast. Set your machine for the dough cycle. Shortly before the dough finishes rising, prepare the sticky sauce. In a small saucepan combine 6 tablespoons butter, 3/4 cup brown sugar and 1/3 cup corn syrup. Heat until it just simmers. Pour evenly into the bottom of a buttered 9″ x 13″ pan. Sprinkle in 1 cup pecans. Punch down the dough and let it rest a few minutes. Then roll out into a 16″ x 10″ rectangle. Spread with 1/2 stick soft butter and sprinkle with 1/4 cup cinnamon sugar. Roll up like a jelly roll and slice into 18 pieces. Place slices in the pan, evenly spacing them. Let rise about one hour. Bake 20 – 25 minutes at 375 degrees. As soon as you remove the pan from the oven, invert it onto a tray or platter. Hints: Here’s a tip I learned from Bob, who used to watch his grandmother do this. Use dental floss rather than slicingthe dough with a knife. Just slip it under the roll and bring it around, cross it and, voila! No smashed rolls! I usually prepare these the night before. After putting the dough in the 9″ x 13″ pan, I cover it with plastic wrap and put it in the refrigerator to rise overnight. In the morning, it’s ready to go into the oven–and we’re ready to eat them warm when they come out–and I didn’t have to get up at o’dark-thirty.